Manual Accounting Practice Sets by Perdisco: What's new in Edition 3? What's new in Edition 3? Detailed instructor and student companions: With many instructors and students using our Edition 2 practice sets wanting to know more about how they work, each of our Edition 3 titles now offers an 'Instructor Companion & Grading Guide' detailing for instructors how the practice set operates and assigns scores, and a 'Student Companion and Helpful Hints' document offering students helpful hints on completing the practice set and maximizing their performance. Integration with Perdisco’s new Accounting Cycle Textbook: All Edition 3 practice sets seamlessly integrate with our new Accounting Cycle 360Textbook. By value-packing the 360Textbook, you will augment your Edition 3 practice set with a 500+ page textbook that ensures consistent instruction for your students on the key features of the accounting cycle, as well as a huge array of included supplements such as slide packs, an instructional video series, podcasts, pop quizzes, self-guided VirtualTutor exercises and integrated AntiCheat homework activities. Video update: What's new in Edition 3? 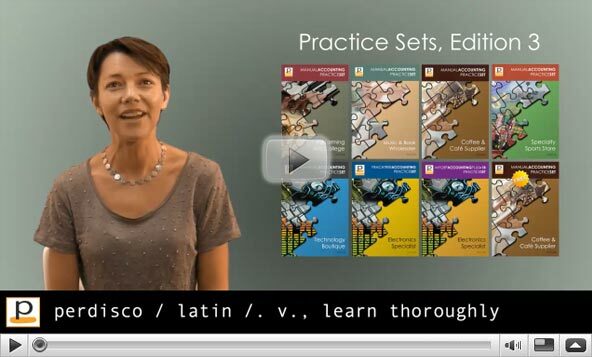 Meg Arthur explains the key improvements made to our Edition 3 practice sets. Progressive scoring: To provide more transparency over our AutoGrade system, each page of our Edition 3 practice sets has the added functionality of notifying students of their current score, the available score for the page they’re completing and the remaining points available for all future pages. This ensures that students have a better idea of the study time required to complete their practice set, as well as how well they are performing overall. Sample exercises updated: Before the graded activities of the practice sets begin, students are offered a number of sample exercises to help them understand how to use the features of Perdisco’s practice set website. In Edition 3, those sample exercises have been extensively upgraded to be more closely aligned to what students will experience when using their practice set. Instructions made clearer: The instructions given to students in our Edition 2 practice sets have been extensively examined and, where necessary, re-written for Edition 3 to ensure that they are easier for students to understand, better assist students in avoiding common mistakes and cover many of the questions instructors had been receiving from students who were completing Edition 2 practice sets. The narrative that guides students through the accounting cycle of each practice set's fictional company has also been strengthened in Edition 3 to ensure that students understand not only WHAT they are doing, but WHY it is important at each stage of the accounting cycle. Access to previous pages: While our practice sets are completed in a forwards-only direction to ensure students cannot go back and change their answers once they have received feedback on them, our Edition 3 practice sets now offer students the ability to view all of the information from previous pages required to complete subsequent pages – so that they no longer need to remember to save or print this. Improved AutoGrade functionality: By combining the Edition 2 usage data of thousands of students across the country with feedback from adopters, we were able to refine the grading scheme and algorithms used by our Edition 3 AutoGrade system. Better VirtualTutor feedback: Using the same student usage data and adopter feedback from Edition 2, we were able to improve the academic feedback given to students after they submit their answers – including additional 'common mistakes'. Improved visual tracking of omitted answers: Students who seek to submit a page before completing all of the required inputs on that page receive feedback from our VirtualTutor warning them if there is a possibility that they have missed certain responses. Improved printing layout: Perdisco’s practice sets are online documents that are designed to be completed in a digital format. Nevertheless, it is possible for students to print out the associated web pages and study offline before returning to the VirtualTutor to provide their answers. Printing long and complex accounting documents is never easy but our instructional and editorial team have reviewed every scrolling web page in its physically printed format to ensure that your students can print their entire practice set onto paper in a reasonable format if that is what they want to do. Compliance with the newest browsers: The technologies supporting our Edition 3 practice sets have been updated and tested to ensure compliance with the newest releases of the Internet Explorer, FireFox and Safari browsers. The academic adjustments below have been applied to all of our Edition 3 practice sets. Access to the accounting worksheet: After completing their accounting worksheet, students now retain access to their worksheet calculations on all of their future pages to assist them in journalizing and posting the subsequent adjusting entries and in preparing the financial statements. Access to general ledger: The instructional design of the general ledger has been reviewed in all Edition 3 practice sets. Not all general ledger accounts are available on every web page of the practice set. This is an important instructional design principle because the presence or absence of certain accounts can be used to assist students in, or to deliberately distract them from, recognizing the correct accounts to be used. Removal of difficult transaction types not commonly taught: Edition 2 titles that covered the treatment of the dividend declared transaction and the bad debts expense transaction have been updated so that these are removed from Edition 3. The complexity of these transactions typically exceeded that taught in most first courses in accounting. Updated bank reconciliation process: The bank reconciliation process has been updated in Edition 3 to require both the adjusted bank balance and the adjusted book balance to be calculated. Further, students are required to record any reconciling items in the general journal instead of the cash journals and the end of month posting now occurs before the bank reconciliation. Closing entries and the post-closing trial balance now placed after financial statements: In Edition 3 titles, closing entries and the post-closing trial balance have been moved to appear after the financial statements in the accounting cycle. Ability to create a single fixed practice set for your course: In addition to being able to offer each student a unique transaction list (our AntiCheat option), our Edition 3 VirtualTutor practice sets now offer the ability to provide all students with the same transaction list so that students can work together on the process - without instructors having to grade their work. A new version can then be set as you require (eg. each semester). Ability to customize account names in the chart of accounts: Certain account names in the chart of accounts can be commonly known by different titles. Adopters can now customize selected account names in the chart of accounts for their individual course. For example, if you want to name the 'Unearned Revenue' account 'Revenue Received in Advance', you just need to let us know. Ability to provide students with depreciation amounts or have them calculate it themselves: For adopters who do not teach the rules for calculating depreciation but who nevertheless want to teach the journal entry required for depreciation, our Edition 3 VirtualTutor practice sets now offer the ability to provide students with depreciation amounts rather than requiring students to calculate them. However, the option still exists for requiring students to calculate depreciation. Edition 3 of our free paper and Excel Coffee and Café Supplier practice set offers a new set of transactions, as well as editorial updates to the company and its accounting policies, improved instructions for students, and an update to the comprehensive grading guide provided to instructors. To find out more about our Edition 3 practice sets, to adopt or upgrade for your course, or to receive a free instructor review copy, please contact us. To find out more about the changes made to each title in our catalog, refer to the academic adjustments section of this page.